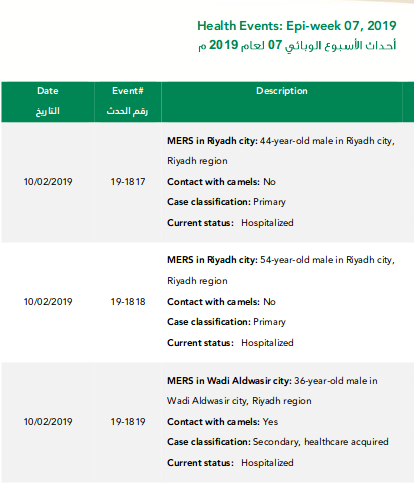 After not issuing a report yesterday, this morning the Saudi MOH has announced 3 new MERS cases; 1 more secondary, healthcare-acquired case from the Wadi Aldwasir cluster, and 2 new primary, community-acquired cases from Riyadh. Today's case brings the Wadi Aldwasir Cluster to 23 cases. In addition to two patients described as primary, with recent camel contact - the MOH has reported 3 different clusters of cases in Wadi Aldwasir. 14 cases have been listed as secondary, healthcare-acquired. 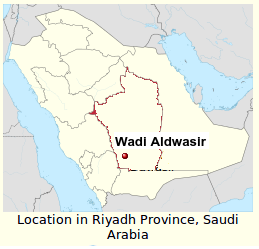 Second to Wadi Aldwasir in cases has been Riyadh, which since the 1st of January has reported (including the 2 cases today), 13 MERS infections. Most have been listed as primary, with no camel contact, leaving the source of the infection unknown. While the lack of cases reported yesterday, and only one new secondary case today from Wadi Aldwasir is ostensibly good news, the incubation period of MERS is up to 15 days, and so it is too early to declare the outbreak under control. 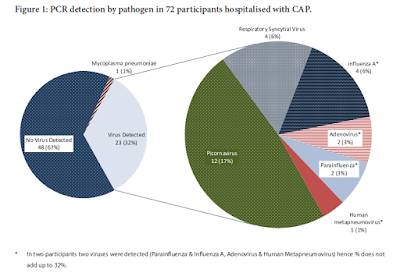 With today's report, the Saudi MERS count for 2019 rises to 43.